If you're using the classic layout in Sierra Mail, you could run into this problem. Reader Darryl Rehr sent in a tip about a new keyboard shortcut in macOS that baffled not just him by its previously unseen behavior, but also a ton of Apple phone support staff. “Near the end, they nearly had me erase my hard drive and restore from Time Machine. Thankfully, I was skeptical,” he writes. Darryl found all his messages in Mail missing except new ones. He assumed corruption or other problems, and went through troubleshooting and then calling Apple support. The culprit was Command-L, which triggers filters. This keystroke isn’t used for this purpose in previous releases. 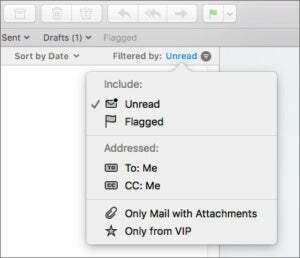 The filter menu provides a couple of visual cues that filtering is active in the modern Mail view.